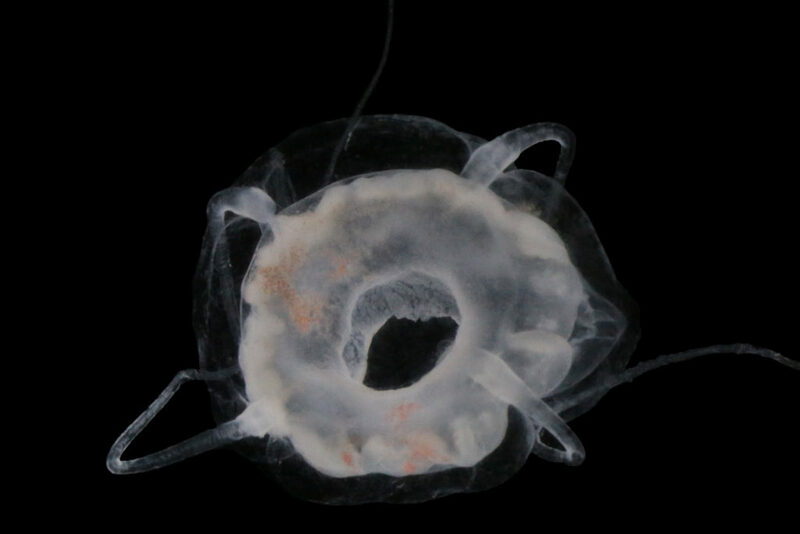 Every now and then, a hydrozoan species will make the headlines because of the problems it creates for humans in a particular location. Hydrozoan jellyfish may bloom unexpectedly, transforming the water into a gelatinous soup, stinging people and fish in the process, while some hydroids have a tendency togrow massively in places where they are not wanted. There are others that end up in the news because they produce some unusual protein, or have a peculiar life cycle that could lead to important findings in the fields of medicine or ecology. 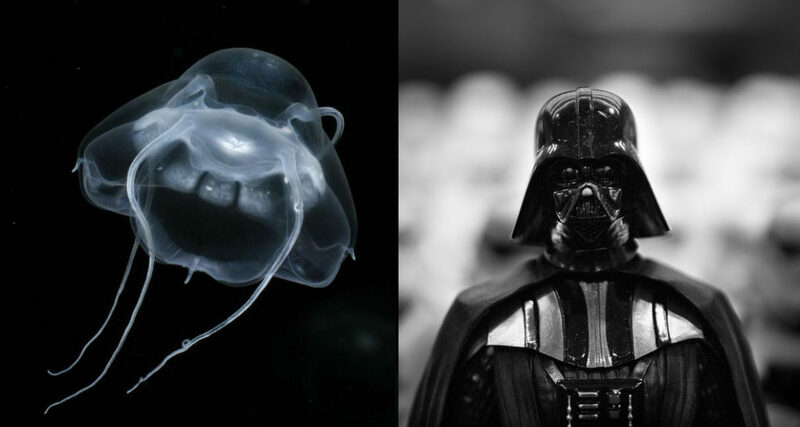 Then there is Bathykorus bouilloni, a hydrozoan jelly that has gotten some media attention due to its resemblance to an extremely famous movie character. This jellyfish was described in 2010 by Dr. Kevin Raskoff, who gave it its appropriate name. Bathykorus is a combination of Bathy (from bathus, meaning depth or deep in Greek) and korus (also from Greek, meaning helmet), and it refers to the deep-sea habitat of the species, as well as to the helmet-like shape of the bell (like that of an intergalactic villain). The word bouilloni in the name of this critter is a tribute to Dr. Jean Bouillon (1926-2009), one of the most prolific authors in Hydrozoan biology in the 20th century. The species has been known to science only for some years, and indeed very few people may have seen it alive, but this does not necessarily mean that it is an uncommon animal: in fact, it may be extremely abundant in some places and is perhaps one of the most common species living at certain depths in the Central Arctic Ocean. We at the HYPNO project are happy to have found this charismatic species off Svalbard, and even more so when it was possible to barcode it through NorBOL! Antsulevich, A. E. (2015). Biogeographic and faunistic division of the Eurasian Polar Ocean based on distributions of Hydrozoa (Cnidaria). Journal of the Marine Biological Association of the United Kingdom 95(08): 1533-1539. Raskoff, K. A. (2010). 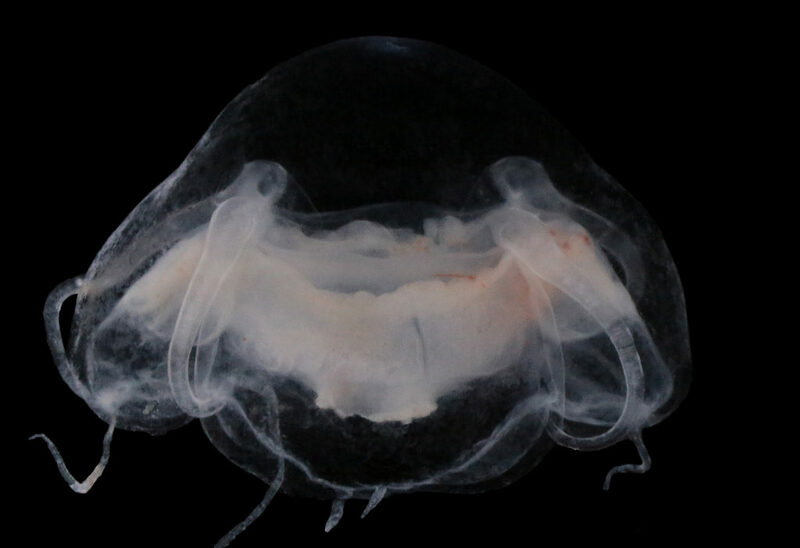 Bathykorus bouilloni: a new genus and species of deep-sea jellyfish from the Arctic Ocean (Hydrozoa, Narcomedusae, Aeginidae). Zootaxa 2361(1): 57-67. This entry was posted in Current projects, HYPNO, Norwegian Taxonomy Initiative, Photography and tagged artsprosjekt, Darth Vader, HYPNO, Jellyfish, Norwegian Taxonomy Initiative on June 23, 2017 by katrine.